The Kaiteriteri and Otuwhero inlets along the Tasman coast are being ecologically degraded by sediment that is smothering plant life, according to a new report. 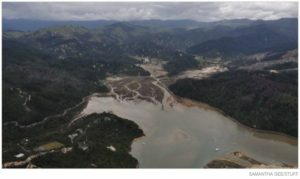 However, sedimentation in the protected Torrent Bay estuary, which has a catchment of native forest rather than pine plantations, remains at pre-human levels, the report found. Davidson Environmental Ltd prepared the report for Sustainable Marahau Inc, funded by the Sustainable Seas National Science Challenge, which is hosted by NIWA. The project was initiated by Stew Robertson, of Tasman Bay Guardians. Ross Morton, of Sustainable Marahau, said the incorporated society wanted a non-biased study in order to “see if our suspicions were correct” – that inlets downstream of areas under pine plantation were more susceptible to significant sedimentation and that was having a negative effect on the environment. All three estuaries have catchments dominated by Separation Point granite, which is extremely erodible bedrock that covers an area about 10km wide and extends for more than 100km from Separation Point in Abel Tasman National Park to Mt Murchison. However, the land use, estuary and catchment sizes vary. Torrent Bay is in the national park. Its catchment is dominated by mature native forest “representative of pre-human land cover”, the report says. The Kaiteriteri estuary catchment is dominated by pine forest in various stages of growth while partially logged pine plantation, unlogged plantation and early regeneration scrub dominate the Otuwhero catchment, near Marahau. “There is no doubt that sedimentation effects at these estuaries is linked to human catchment activities,” the report says. The Abel Tasman estuaries are naturally dominated by “coarse substratum” composed of granule, coarse, medium and fine sands. Mud is naturally uncommon, the report says. However, despite silt and clays being a small component of the material arriving at the coast, mud has increased in the Kaiteriteri and Otuwhero estuaries. Recently, some salt marsh and herb field habitats have also been smothered. “Smothering of estuarine vegetation in these ecologically important estuaries contravenes the NZCPS [New Zealand Coastal Policy Statement] sections 11a and 11b,” the report says. Field work for the report was conducted on March 29 and April 4, several weeks after ex-Tropical Cyclone Gita hit the Nelson-Tasman region when there were “numerous slips and subsidences” in the catchments. Overall, the Kaiteriteri estuary appears “little impacted” by Gita. However, in the conclusions section, the report says it is “highly likely that adverse impacts” will occur when the catchment is disturbed during forestry harvesting activities coinciding with a major rainfall event. Otuwhero Inlet was “impacted” by Gita with new fine sediment deposited on the coarse base adjacent to the main stream. Further along the coast, the Torrent Bay estuary appears unaffected by Gita with “no indication of a silt layer”. The report says the investigation confirms the two estuaries with modified catchments are being ecologically degraded. Morton said as a result of the evidence in the report, Sustainable Marahau hoped there would be tighter controls on forestry practices in order to protect the natural environment. “This is not about stopping forestry, it is about impelling NZ to adopt best international practice or to create world-leading new practices that are much more sustainable than those currently being followed,” he said. Robertson said the report provided a benchmark for monitoring the “hopeful” recovery – or degradation – process of the estuary.